Overall 9-3/8 inches in length with a drop point plain-edged blade 4-7/8 inches long, the Pygmy ATAK still provides plenty of knife for camp chores and field dressing game. The knife's flat grind increases the cutting efficiency, blending the cutting bevel into the blade smoothly without reducing the knife's strength. You'll get edge-holding as good as old-fashioned carbon steel blades but with the corrosion-resistance of stainless steel. The blend comes from a tool steel core coated with protective chromium. This full tang knife features a black glass-filled epoxy handle textured for a secure grip and shaped with a dropped bolster and finger choil. The handle design allows fine control and a comfortable shape intended for long-term work as well as a safe grip for heavy cutting, piercing, and chopping tasks. One special characteristic you won't see is the electrical resistance of this handle material. The grip fully encloses the knife's steel and protects the user if the blade cuts into a live electrical wire. This composite won't soften when exposed to chemicals and also resists heat up to 300 degrees C.
The Pygmy ATAK comes with a custom-fitted Kydex sheath meant for the belt and weighs about six ounces. 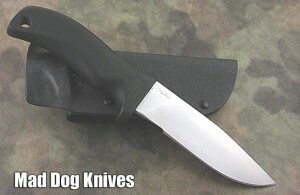 Earlier models include the Mad Dog logo on the blade, and current production should be marked with a serial number. Exact weights and measurements could vary. Try the Ka-Bar Bull Dozier for another tactical fixed blade style well suited to the needs of sportsmen.